Nepal does not only present magnificent mountain trekking, climbing, expedition and raging river rafting but it also has a fine selection of spotless national parks. Nepal offers you the chance to enter the jungle and view some of the rarest and most endangered wildlife on earth. 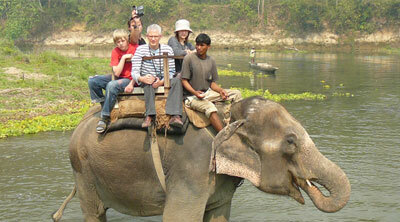 Safari tour in Nepal can be a very exciting experience. It is a great way to relax after a trek and soak up the jungle environment, bring your kids along and have the family holiday of a lifetime. Nepal has nine National Parks, three Wildlife Reserves, One hunting Reserve, and three old plus three new total six Conservation Areas. It’s covering a total of 28,998.67 square kilometers of the country's total land. This is the richest habitat in the land with tall grasslands interspersed with reverie and hardwood Sal Forest. Here, one can see wildlife such as One-horned Rhino, elusive Royal Bengal Tiger, Leopard, Verities of Deer, Sloth Bear, Rhesus Monkey, Wild Boar, Jackals, Civets, Mongooses, Cats, Snakes and other reptiles. The rivers and lakes are home to Crocodiles and the Extraordinary Genetic Dolphins. Bird-watchers delight with more than four hundred fifty migrant and local species birds recorded is Cormorants, Herons, Egrets, Storks, Cranes, Ducks, Woodpeckers, Hawks, Osprey, Falcons, Kestrel, Parakeets, Ibis, Kites, Cooks, Kingfishers, Swallows, Orioles, Drogues, Babblers and many others. The most fascinating and consideration- grabbing program offered by Nepal not found elsewhere in the world is regard as jungle safari. In Nepal, you will discover the ideal situation of viewing the jungle scenery, birds and animals and the indigenous local people, their colorful tradition, unique dress and languages. In the jungle, you can knowledge, elephant back safaris, bush walking, bird watching, canoeing, recreation activities and cultural programs, depending on which park you choose to go. You can walk into the jungle by foot with an experienced walker, by elephant back, by dugout canoe or by jeep. A wildlife Jungle safari in Nepal is a fun filled package ideal for anyone. Asian Hiking Team make a package for you that included everything from you sleeping arrangements to meals to day's full of activity as well as we display up to your awareness.